Have you forgotten or lost your Locu password? No worries: It's one of the most common issues for all our customers. The instructions below will get you back in business in no time. 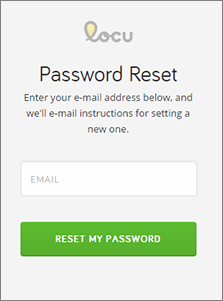 We'll send you an email containing instructions on how to reset your password. Note: If you don't receive our email within a few minutes, check your junk mail folder. If you still don't see the email, make sure you're checking the email account you entered in Step 2 or contact Support to make sure the email is associated with your Locu account. If you can't remember the email address you used when signing up for Locu, contact Phone Support using the phone number or Chat With Us button in this page's right-hand column.